The Community Nutritionist is a Registered Dietitian that provides nutrition assessment and counselling services to NFN individuals of all ages and families on topics related to healthy eating, food security, diabetes, weight management, blood lipids management and hypertension. The Community Nutritionist works closely with other programs on various activities and events such as the Diners’ Club, Summer Children’s Program or staff Lunch and Learns. This program supports improved maternal and infant nutritional health for women and families from preconception, pregnancy, birth and parenting. Pregnant women, new mothers with babies up to 12 months of age are eligible to register with CPNP. CPNP participants can opt into the Good Food Box, and Milk Coupon Program at no cost The CPNP offers education session on various topics related to pregnancy or infant health including infant feeding (breast feeding, baby food making). The Good Food Box aims to promote healthy eating and bring fresh produce into more homes in our community. Each month, boxes are provided to CPNP participants, eligible clients of the Food Bank, and to any community members who would like to purchase a box. This program runs the third week of each month, and staff of the Lawrence Commanda Health Centre, , and volunteers work together to assemble and deliver the Good Food Boxes. Each box includes a monthly newsletter with recipes and tips on healthy eating and activity. The garden brings community members together to care for, harvest and watch over the garden, while providing healthy food grown by our community for our community. 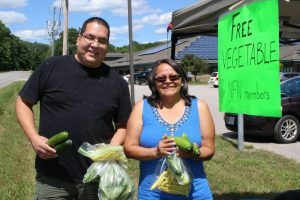 We host garden stands across our communities to distribute produce, and community members are always welcome to access the garden to pick their own produce. These workshops give participants hands-on experience preparing different recipes to help build skills in the kitchen and for some, a chance to taste new foods or recipes. Participants share a meal that they have cooked and take home pre-prepared meals for their families. 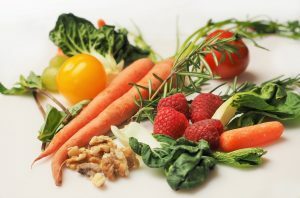 There is also a nutritional component, where topics such as increasing fibre, decreasing sodium (salt), balancing meals, and reading nutrition labels are discussed.